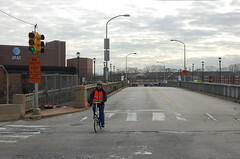 John Boyle, Advocacy Director for the Bicycle Coalition of Greater Philadelphia (and main blogger of Philadelphia Bicycle News), rode the very last vehicle to cross the South Street Bridge before the Streets Department and their contractors closed the fourth side of the bridge around 10:45am this morning. The Bicycle Coalition joined Jim Campbell and Marcia Wilkoff of the South Street Bridge Coalition and about 40 others to commemorate the final crossings of the Bridge and to watch the contractors close off each of the four entrances to the Bridge one after the other. For more photos taken during the 2 hour event, click on the photo.